When the S.S. Ethie crashed into the rocky Canadian shoreline during a blizzard in 1919, a dog named Tang helped rescue everyone on board. With the ship’s rope clenched in his mouth, Tang paddled through frigid, choppy waves to the shore. All 92 passengers and crew, including a baby in a mail sack, were safely rescued. To recognize Tang’s heroic efforts, the insurance company Lloyd’s of London is said to have bestowed him with a medal of bravery. Today, some dogs still perform lifesaving water rescues from shores, boats and even helicopters. Water rescue dogs are trained to swim to the victim, who then grabs a handle on the top of the dog’s life jacket and is towed to safety. If the swimmer is unconscious, some dogs can flip the person on their back so their head is out of water, grip the upper arm and bring them to shore. Or if a small boat is stranded, the dog can use a rope to tow the vessel and passengers in. Although any dog can go through training, the best water rescue dogs are large breeds that have the strength and endurance to tow people or even small boats over distances of a mile or more. (Pugs, Chihuahuas and bulldogs, for example, need not apply.) Breeds that naturally love the water (Newfoundlands, Portuguese water dogs and Labrador retrievers) are ideal. 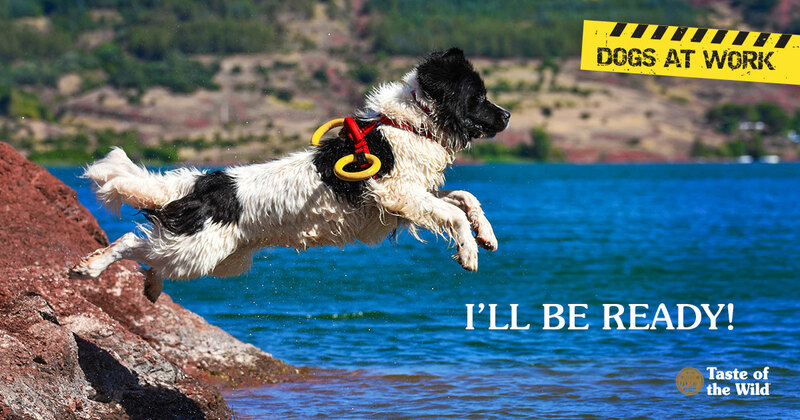 Of these breeds, the Newfie is probably the most popular water rescue dog. The breed’s large size gives it the power to haul survivors, and its thick, insulating coat enables it to withstand icy water temperatures. With webbed paws made for paddling and a tail that doubles as a rudder, this gentle giant is built to follow its natural instinct to watch over people. It should come as no surprise, then, that one of the most respected programs for water dog training is through the Newfoundland Club of America. The program consists of three tiers of training. Dogs that pass the first tier receive the title of “Water Dog.” These dogs have passed six tests, starting on land with basic obedience commands. In the water, the dog must successfully retrieve a bumper, fetch a lifejacket or boat cushion, deliver a rope to a “drowning” swimmer, tow a boat and swim with a handler, following commands. Dogs that successfully complete a more complex set of tasks receive the title of “Water Rescue Dog.” For example, the dog must determine which of three swimmers is “drowning,” bring that person a life preserver and help them back to shore. Finally, elite dogs can achieve the title of “Water Rescue Dog Excellent.” At this level, dogs must complete challenges that include taking a rope to multiple victims, rescuing an unconscious victim and finding a victim under a capsized boat and towing him or her to safety. Today’s water rescue dogs follow a long line of canine heroes. According to one legend, a black Newfoundland named Rigel played a heroic role in the sinking of the Titanic. The dog is said to have swum next to a lifeboat for three hours in search of his owner. When a nearby steamship was headed straight for the lifeboat, Rigel’s barking alerted the ship, whose crew was able to save both the passengers in the lifeboat and the dog. Another water rescue dog, Gander, took his efforts ashore and saved his Canadian army platoon from a grenade. Most water rescue dogs aren’t enshrined in legend, but their everyday efforts are no less important.